When you cinch up a zip tie around a bundle of cables, you don’t always plan on having to remove it at some point – but often you end up doing just that. 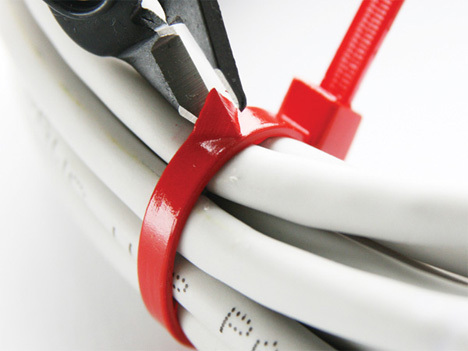 Trying to stick a pair of scissors or a knife tip between the thick plastic zip tie and the relatively delicate cables can result in accidental cuts to those cables or to your skin. Designers Kim Seokhui, Kim Seongjin and Lee Jongsung re-thought the cable tie in a completely brilliant way: they added a simple notch. 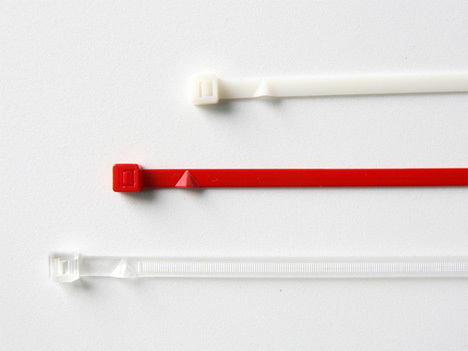 The notch turns the humble zip tie into the Easy_To_Cut zip tie, a 2012 Red Dot Award winner. 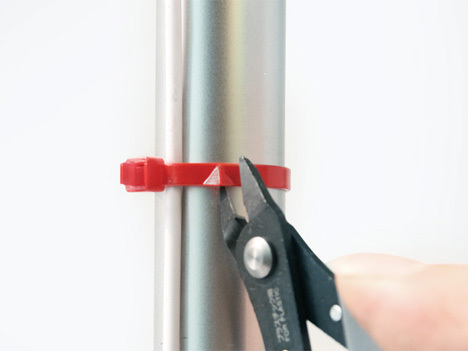 The Easy_To_Cut zip tie includes a small notch into which the tip of scissors can easily fit. When you close the scissors on the little notch, the zip tie severs easily – no need to dig, stab, or cause crazy finger injuries just to cut a little piece of plastic. See more in Home & Personal or under Gadgets. February, 2013.